You subscribe to the basic idea that business can do more than make money, but you're not sure how to act on that conviction or how to share it with the rest of your organization. The Conscious Capitalism Field Guide--the authoritative follow-up to the bestselling book Conscious Capitalism, by John Mackey, CEO of Whole Foods Market, and leadership expert Raj Sisodia--gives you the tools for sharing and implementing the principles of higher purpose and conscious business throughout your organization. "A valuable workbook on how to turn business relationships from win-lose into win-win-win." Tony Schwartz, CEO, The Energy Project; author, The Way We're Working Isn't Working--"This timely guide to building a more human and more sustainably high-performing organization is concrete, actionable, and suffused with the passion of its authors to create great workplaces and change the experience of all of us who spend the greater part of our lives at the office!" 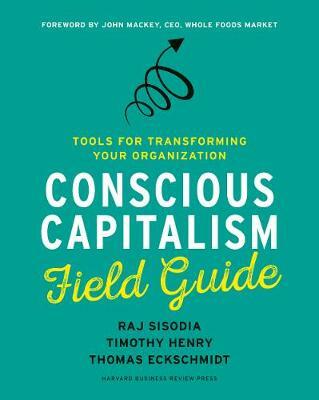 "The Conscious Capitalism Field Guide illuminates the path that businesses can take to become more conscious. It should be essential reading in boardrooms and business schools." "This book is a road map for corporate leaders interested in creating cultures that value innovation and social consciousness and building successful organizations that make a positive impact on the world." "This book gives a compelling account of why the successful companies of the future will be those rooted in a deeper sense of purpose, which it combines with a highly practical road map on how to move from aspiration to action."